During the 1960s, the Domodedovo air shows outside Moscow were a favorite venue for showing-off all the latest in Soviet hardware, and projecting intimidation toward NATO and the West. The 1967 show was particularly memorable, marking as it did the public debut of the super-secret MiG-25, the Yak-36 VTOL demonstrator, and the MiG-23. During the course of the flying demonstrations, a lone dark shape darted across the sky. Long, lean and menacing, this was no technology demonstrator, nor an early-production development project, but a cutting-edge fighter in current production, and a warning to the West of what awaited anyone foolish enough to make a reconnaissance incursion into Soviet territory. 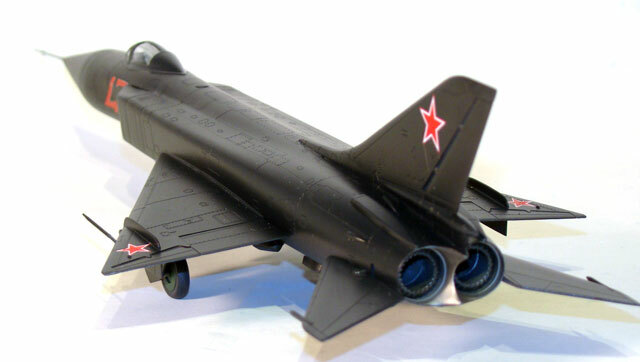 The Sukhoi Su-15 was a truly capable interceptor, with a combination of range, performance and weapons systems considerably superior to anything the Soviets had yet been able to field, and presenting a very substantial threat to the photo-recon snoopers which had been a pointed annoyance and embarrassment for years. Developed incrementally from the Su-9 and -11 program, the Su-15 began as an in-house project, and was something of a last-gasp effort to save the design bureau, which had fallen into disfavor thanks to the political machinations of Alexander Yakovlev, the head of the Yak design bureau, and a minister of aircraft production. (no conflict of interest there!) Going back a few years, when the Sukhoi Su-9 was introduced into service, it was like nothing else that had come before. Capable of Mach 2 performance, it was a “hot” airplane, and was a real handful for Soviet pilots to adjust to. Compounding this problem was the relative unreliability of the Su-9’s engine, the Lyulka AL-7. A large, powerful turbojet, it also presented a technological leap, and a whole new set of challenges to the Soviet air force. A spate of accidents hung a label on the Su-9 as a dangerous, unreliable airplane early in its career. Demagogueing this issue, Yakovlev successfully argued that a twin-engine design, coincidentally like his Yak-28, would be much safer, and securing a termination order for his rival’s production run. Things were looking pretty bleak at Sukhoi. But when the Flagon (as the Su-15 was christened by NATO) was revealed, it was a whole new ballgame. Sukhoi located a pair of Tumansky R-11 engines, the same power plant employed by the then-under-development MiG-21, in the tail of the aircraft, and employed the bureau’s earlier experience with lateral intakes to free the nose for a large radar. This produced a much cleaner, faster design than the clunky-looking Yak, which proved to be the swan song for Yakovlev in the high-performance fighter market. Indeed, the Su-15 is one of those aircraft that looks like it’s going mach 2 while sitting parked on the ground. Trumpeter has a hit-and-miss track record for accuracy and fidelity to the original in their model kits. Unfortunately, the Su-15 series is not one of their best-efforts by most accounts. But here I must digress a bit with a few words on “accuracy.” As modelers, we are mostly dependent upon the work of others for our reference material, and sometimes that material can be wildly variable. There are few better examples of this than Soviet Cold War subjects, about which detailed information was mostly unavailable until the mid-1990s as a result of that regime’s legendary paranoia and secrecy. I have had a keen interest in the Su-15 since I was a kid in High School, (1970s) when I first saw a few sparse accounts about it in a couple of Bill Gunston books. Over the years, I have collected everything I found on this airplane. (See the references section..) In addition to differing published accounts of its dimensions, there have been numerous sets of drawings released over the years, which don’t always agree with each other. The widely accepted “best” set of drawings were produced by Vladimir Rudenko, and appeared in the Czeck magazine Zlinek, among other places, although you can still find some disagreement over whether these are truly the “best.” The point I’m getting to is, unless you have the opportunity to crawl over an original with a tape-measure and a note-pad, you’re going to have to rely upon the word and the work of someone else. Sometimes this work can be reliably verified, sometimes not. As modelers, I think we can sometimes get a little too obsessed with the question of accuracy. Although a few reading this will consider it heresy to say so, none of us will ever build a completely, 100% accurate scale rendition of anything. Back to the subject at hand, the Trumpeter kits appear clearly to be pantographed down from their 1/48th scale efforts for this type, although with some commendable attempts to correct a few obvious and widely remarked-upon flaws. Unfortunately, some others remain. They corrected the angle of the nose, giving it a more proper downward cant, but did so in a way that presents other, difficult to correct issues with the symmetry of the radome, and the separation line with the rest of the nose. The radome itself is also much too long. If you are going by the Rudenko drawings, you will also find that the fuselage is a bit long, and the wings are slightly too small, and are angled incorrectly, but this is less noticeable. The speed brakes are too small, as with the 1/48th scale version, but are molded closed in this scale. The cockpit is pretty sparse, and the instrument panel is completely devoid of detail, without even a decal to represent the instruments. Most egregious perhaps is the principle color scheme, prominently rendered on the box cover. This represents a red Su-15, ostensibly a member of a flight display team, and based on a 1970s vintage re-colored photograph. 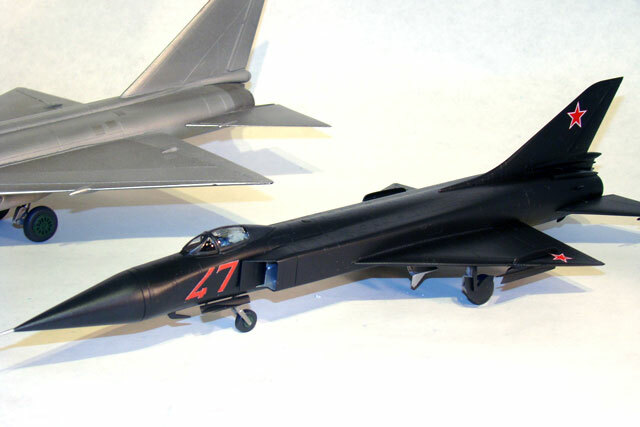 The trouble is, the Su-15 was never used by a flight display team, and the color scheme is completely fictitious! All this said, I must say this kit is the best-done from an engineering and “buildability” standpoint of any Su-15 kit on the market. The VES kit, if you can find it, adheres closely to the Rudenko drawings, and the Amodel kit is a reasonable second-place finisher by this measure. I have both of these kits, and must say the VES offering is maddeningly difficult. Amodel’s offering is typical of their kits, which usually are heavy in their molding, and are plagued by fit problems, although usually very accurate. Trumpeter’s offering is much friendlier, and many of the issues are correctable, as we shall see later, with the end result being very believable as a representative of the type. There were no real problems presented by this kit. The fit was generally very good, with the only filler really required being to blend-in part E1, the upper-forward fuselage surrounding the cockpit, and part B4, the lower-forward fuselage around the nose-wheel well. I also needed some filler on the center-line seam on the bottom of the fuselage, but this was due to my own inattention in gluing this seam, which produced a step that had to be erased. I elected to use a few after-market parts, including Pavla’s excellent replacement radome, and a Neomega ejection seat, which is the only real part of the cockpit visible once the canopy is closed. Fitting this seat required some surgery to the cockpit tub, including the removal and replacement of the floor so that the top of the seat would clear the inside of the canopy. Although Pavla’s nose cone is cast in solid resin, I elected to add a bit of lead fishing weight, just to be sure, although this particular aircraft has a great deal of mass forward of the main gear, even as a model. One of the details you consistently see on the 1/48th scale version of Trumpeter’s Su-15 is the open air brakes, a feature not offered on this version of the kit. While I won’t pretend to be a comprehensive expert, I have collected a considerable quantity of reference material on the Flagon, and have yet to find a photo of one parked on the ground with the brakes open, so I am perfectly happy to leave them closed. The fact that they are a bit small, which was glaring in 1/48th, is barely noticeable in this scale. I left-off the horizontal tail planes, and all the other smaller parts for separate painting, as my usual custom is to otherwise break them off several times during the finishing process. I had started-off the finishing process by doing the interior of the intakes, the wheel wells and inside gear doors, and the inside of the engine exhaust area in a couple of shades of Alclad. The interior of the intakes were actually masked before assembly. I need to take a moment to say that I am eternally thankful to Eduard for developing a line of canopy masks. I really HATE masking canopies and windscreens. While I am quite happy to muddle about with mind-numbing, tiny, inconsequential details, I have likewise allowed models to languish on my bench for months at a time, simply because I could not work myself into masking their clear parts for painting. Eduard’s masks are worth their weight in gold, I buy them for every kit I have that they make them for, and yes, I absolutely used their set for the Su-15. When satisfied, I turned the drawing over to my charming and vivacious wife Vivian, who is a master of Photoshop. She cleaned-up my rendering, giving it nice sharp edges, and with my guidance, produced a print-out to scale. With several of these in hand, I proceeded to use them as a template, and carefully cut a mask from Tamiya tape, which was applied to clear decal film, and airbrushed first with white, and finally with two coats of red, matched as closely as I was able to the color of the stars already adorning the wings and tail. The custom decals worked perfectly, and once applied, the model received two coats of a custom mix of Polly Scale clear gloss and flat, slightly favoring the gloss. 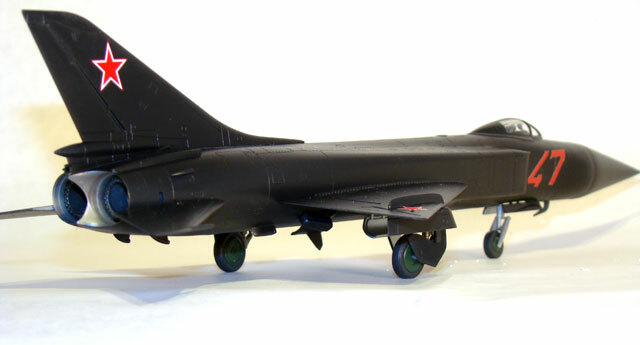 As this was a one-time paint scheme for an air show, weathering was simple: there was none! The horizontal tail plans, landing gear, and other bits were now added to complete the project. About 20-some years ago, I was really into photography. Obviously, I have since lost most of what I learned during that period of my life. But one thing I do remember is how difficult dark subjects, particularly those that are all-black, are to photograph. Photos are from my Sony Cybershot in aperture priority mode, but still regrettably (and involuntarily) very automatic. I found the shots improved when I added my Amodel Lavochkin La-250 to the picture. As is probably obvious, I am a borderline fanatic about the Su-15. But as I also suffer from a nearly debilitating case of Magnum Opus Syndrome in my modeling, this is the first Flagon I have ever completed. By way of excuse, I will say that many of the subjects available over the years have been decidedly questionable, although I own nearly all of them, including the atrociously expensive (and bad) Collect-Aire kit. Trumpeter’s 1/72 version of the Su-15 has its flaws, but it is a pleasure to build, and is unquestionably a reputable rendition of the type when compared with photos of the real thing. Add Pavla’s radome replacement, and in my opinion, it becomes more than acceptable. Soviet aircraft have a distinct look about them. They always have, going back to the 1920s and ‘30s, but it may never have been so apparent as the Cold War period. While photographing this model, I could not help but to be struck by how well it captured the look of the genuine article in so many of the photos in my collection. This aircraft captured my imagination as a boy, and this model has stirred that feeling again, many years later. For me, that’s what modeling is about.